Den som inte visste var den lilla byn Sibbhult låg fick den rejält placerad på kartan av Gösta Bohman. Där, i nordöstra Skåne, hade arbetarekommunen motionerat om avsikten att de svenska produktionsmedlen ”alltmer övergår till samhället och de anställda”. Den socialdemokratiska partikongressen hade antagit motionen. Varför har den Europeiska Unionen infört Euron och Schengen fastän det stod klart för de flesta att detta var högriskprojekt ? Jo, därför att de romantiska utopisterna vill skapa en riktig Union, som USA. En stat med Parlament, Domstol, en yttre men ingen inre gräns, ett EU-pass och medborgarskap samt naturligtvis en valuta. Frimärkena kommer väl senare, liksom försvaret som dock redan är under uppbyggnad. European leaders will agree to delete references to the flag in the constitution. Everybody knows the flags will keep flying. The constitution is a symbol. 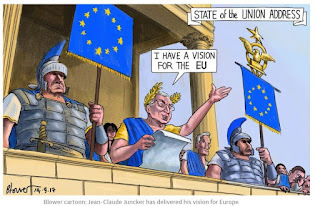 After decades in which the EU has gradually accrued more powers – without going out of its way to draw attention to the fact – the creation of a real constitution was a coming-out party for those who believe in a European political union. Rather than disguising the true aim of the “project”, European federalists were proudly proclaiming it – and seeking popular endorsement. So the rejection of the constitution was a crushing blow. 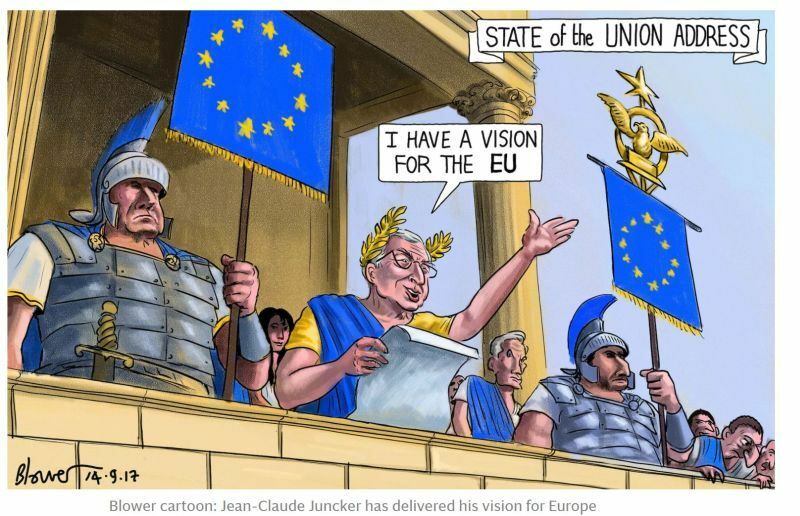 The federalist response – pushed by the Germans who will be in the chair at next week’s meeting – is to repackage the constitution and to try to push it through regardless. The name constitution will be dropped. Instead, the document will be called a treaty and will be stripped of the symbols of statehood – like the flag and the EU anthem. But very little of the legal substance will change. The aim is to make the constitution seem dull and technical – and so to allow governments to push it through parliaments without any unpredictable referendums. and provides by far the largest stock of “target” overdraft credit to other European countries, currently €956bn. The proportion of U.S. equity-fund assets that are passively managed has nearly doubled in that time to nearly 40 percent. Germany even gave up its fabled deutschmark, a totem of hard-earned postwar affluence, to forge a monetary union and satisfy French and British fears over its post-reunification muscle. the insidious illusion of permanent liquidity has not gone away. insidious = proceeding in a gradual, subtle way, but with very harmful effects. More than $425bn, or 12 per cent, has been knocked off the value of S&P 500 financial shares since they set a post-crisis record in January. Until Greece can successfully sell a multi-billion euro bond to international investors, it can’t truly be said to be on a sustainable path. An offering could come as soon as July, but yields need to fall further and investors need to turn up in size. Neither is certain. For now, the European Union, the International Monetary Fund and European Central Bank have chosen to extend and pretend. World debt ratios have spiralled to record levels during the era of super-easy money and markets are showing tell-tale signs of late-cycle excess, leaving the international financial system acutely vulnerable to a jump in borrowing costs. Any reversal in our fortunes could be “quick and sharp”, says the Bank for International Settlements, the venerable global watchdog based in Switzerland and the scourge of dissolute practice. "Det kommunistiska partiet har skapat ofantligt mycket som är värdefullt och framtidsdugligt. Det har bland annat – och det är en stor sak – befriat det ryska folket från påträngande materiell nöd, medan samtidigt miljoner svälter i Förenta Staterna"
Olof Lagercrantz om Sovjetunionens kommunistiska parti. Dagens Nyheter, 11/7 1968. Tänk om dom hade fått igenom sina förslag! Pierre Moscovici, the EU’s economy commissioner, said after the meeting. The earliest repayment deadlines shift from 2023 to 2033. An agreement was close that would leave Greece with minimal repayments until after 2030 on the €228bn it owes to the rest of the eurozone. The latest deal on debt won’t work, and everybody knows it. Att vända utvecklingen till mer subsidiaritet, färre åtaganden och större fokus på just den inre marknaden är inte en helt enkel uppgift. Det finns goda skäl att vara kritisk till hur det europeiska samarbetet har utvecklats under de senaste åren. Förslaget på nästa långtidsbudget med nya utgiftsökningar och egen beskattningsrätt för unionen är ett. Kommissionens generella ovilja att lyssna på den kritik om centralisering och överstatlighet som åtminstone delvis föranledde det brittiska utträdet, är ett annat. Kommentar RE: Lycka till Catarina i arbetet för att vända utvecklingen inom EU till mer subsidiaritet och färre åtaganden, mer som EEC än som EU och ett nytt Romarrike. It has become a source of discord. The story of Italy is revealing and, given its size, of crucial importance. All of this was predicted. In his excellent EuroTragedy, Princeton University’s Ashoka Mody cites a critique of the 1970 Werner Committee report, the first blueprint for a monetary union, by Nicholas Kaldor, a British economist of Hungarian origin. Kaldor argued there would need to be fiscal transfers. That would require a political union. But the conflicts created by the currency union would fester, making moves towards such a union more difficult. So it has proved. Germany increased its competitiveness by keeping wage growth muted in the worst years of the global financial crisis. For three years, the ECB has allowed investors to overlook the fragilities in the public finances of several member states and the flaws in the monetary union. Governments must now learn to do without the central bank’s support. and deposited them across the Eurosystem's banking institutions. Italy, the eurozone’s third largest economy, has chosen what can at best be described as a Euroskeptic government. trots varningar om att Sverige då inte hade den förmågan. Statssekreterare Karolina Ekholm intervjuas av Per Lindvall Realtid 15 juni 2018. Karolina Ekholm är professor i nationalekonomi. Hon var vice riksbankschef under åren 2009-2014.
att "nationella valutor med rörliga växelkurser fungerar som handelshinder. Därför är en gemensam valuta ett naturligt och nödvändigt steg för att realisera den gemensamma marknaden". Sådant kan man bli professor för i Sverige, tråkigt nog. Man kan också efter denna lojalitetsförklaring till euron bli både vice riksbankschef och statssekreterare. Kanske en svensk Deep State? Fed höjde räntan med 0,25 % till 2 procent. Marknaderna skälvde. För tio år sedan höll världsekonomin på att implodera efter det att Lehman Brothers gick i konkurs. Sedan dess har världens centralbanker hållit räntan runt noll procent. Nu måste de höja räntan igen för att skuldsättningen inte skall skena vidare. Men debatten rasar om huruvida detta är för tidigt. Många är osäkra på om världens ekonomi tål högre räntor utan att implodera igen. “The problem with QE is that it works in practice, but it doesn’t work in theory,” said former Fed chairman Ben Bernanke. Monetarists and "creditists" disagree profoundly over the mechanism. Which of the two is right will determine whether the world muddles through or crashes into recession in 2019. Ready to weather the storm? The end of the bull market is upon us. Or maybe it’s really close. Nobody really has a clue on the timing, of course. MarketWatch 12 June 2018 with nice pic of gathering storm. A Euro Tragedy - a clear mistake, a triumph of a political ideal of European unity over basic economics. As the /book/ title indicates, this is not a pros versus cons assessment. Instead the author treats the Euro as a clear mistake, a triumph of a political ideal of European unity over basic economics. Hans Lindblad, om att vi främst kan erbjuda tillgång till svenskt luft-, sjö- och landterritorium. bond yields heading to zero and a collapse in equity values after the Japanese bubble burst at the end of the 1980s. $2.34tn of treasuries will be sold in the next two years. The main, obsessive focus for debate around the Fed right now is whether it will raise policy rates three or four times this year. But if Urjit Patel, the governor of India’s central bank, is correct, this obsession with US interest rates misses the point. The Great Disrupter is fixing to do his thing at the G-7 meeting, and his impending rebuke to the keepers of the G-7 "consensus" could not be more welcome. That's because these so-called globalist multilateral institutions are the real enemy of democracy, capitalist prosperity and human liberty in the world today. The G-7, the G-20, NATO, the IMF, the World Bank, the WTO ( World Trade Organization) and the rest are the vehicles through which the permanent political class rules and ruins the world. That is, elected presidents, prime ministers and parliamentarians come and go. But mostly they get led around by the nose by the bureaucrats and apparatchiks who run their governments, populate their think tanks, NGOs and lobbies and propagate their group-think through the likes of G-7. But the gap is still on track to widen in 2018 to the highest level in a decade. has taken aim at plans for creating new eurozone funds to help crisis-hit countries, urging governments to instead make greater efforts to put their finances in order. ECB president Mario Draghi last month called explicitly for the eurozone to equip itself with “an additional fiscal instrument to maintain convergence during large shocks, without having to overburden monetary policy”. Hakelius EU har i drygt tjugo år målmedvetet valt en strategi som går ut på att stänga alla nödutgångar. Priset ska göras så högt att ingen vågar backa. EU-fantaster applåderar Macrons imperiedrömmar, men de skulle bara öka bara de klyftor som öppnat sig mellan öst och väst, syd och nord. Problemet är att ingen verkar kunna formulera alternativ med politisk kraft. Det enda som kommer är lite mildare varianter av Macronmodellen. Yet when I think of the sums earned by those responsible for dumping this mess on to the UK taxpayer, even my blood boils. This is a minimalist agenda but, unlike Macron’s, it’s detailed and actionable. It’s also largely in line with the European Commission’s ideas. This effectively reduces Macron’s grand economic union visions to the most politically harmless, and cheapest, measures. It was the unconditional pro-Europeanism of Italy’s past leaders that gave rise to the current nationalist backlash. If you are really pro-euro, my advice is to stop treating the euro as an article of faith but fight for its sustainability. I wanted to keep Greece in the eurozone sustainably and was clashing with Germany’s leaders in favor of the debt restructuring that would make this possible. a majority in Italy’s parliament that dreams of exiting the euro. Germans and French are better off than the Italians compared to 17 years earlier. Germany, joined by the Dutch, Finns, and Austrians, runs a monster $1 trillion plus trade surplus with the rest of Europe and the eurozone. published in November 2012, sets out the Commission's vision for future euro area integration. Since the eurozone crisis began receding in 2012, too little has been done to fix the underlying problems of the single currency. A fragmented banking system, inadequate crisis rescue capacity and a lack of fiscal flexibility to offset asymmetric shocks. putting him on an inevitable collision course with Brussels and Germany’s policy elites. and therefore has no backstop defence for its commercial banking system. The European Central Bank is progressively removing its shield as quantitative easing is wound down and purchases of Italian bonds fall to zero. There will be no protection by the end of the year. The Draghi pledge to do “whatever it takes” no longer holds. No future rescue by the ECB is possible unless the Italian government of the day – endorsed by parliament – formally invokes the bail-out mechanisms (OMT-ESM) and accepts austerity imposed by Brussels. The rise of the populist politics represented by the anti-establishment Five Star Movement and the far-right League is an all-too-comprehensible consequence of gross economic mismanagement both within Italy and in a very imperfect monetary union. Within the monetary union, Italy cannot address this competitiveness issue through devaluation. The only remedy is internal devaluation via wage deflation. Yet despite unemployment of 11 per cent and youth unemployment at a devastating 35 per cent, unit labour costs have not come anywhere near to delivering that internal devaluation. In reality, the level of unemployment that would be required to restore competitiveness might well be unthinkable.